UPDATED: Sun., Feb. 26, 2017, 9:37 p.m.
WASHINGTON – The Pentagon wants to expand the military’s ability to battle al-Qaida-linked militants in Somalia, potentially putting U.S. forces closer to the fight against a stubborn extremist group that has plotted attacks against America, senior U.S. officials said. The recommendations sent to the White House would allow U.S special operations forces to increase assistance to the Somali National Army in the struggle against al-Shabab militants in the fragile Horn of Africa nation, the officials said. They said the proposal would give the military greater flexibility to launch airstrikes against extremists that appear to be a threat. Beefing up the military effort in Somalia fits with President Donald Trump’s broader request for a Pentagon plan to accelerate the U.S.-led battle against the Islamic State group in Iraq and Syria, and defeat other extremist groups, including al-Qaida and its affiliates. U.S. concerns about al-Shabab escalated in recent years as young Americans from Somali communities traveled to training camps in Somalia, raising fears they might return to the United States and conduct terror attacks. Somalia was one of the seven predominantly Muslim countries included in Trump’s travel ban last month. The executive order has since been suspended by federal courts. Somalia is “our most perplexing challenge,” Gen. Thomas Waldhauser, the head of U.S. Africa Command, said in an interview with the Associated Press. The United States is “trying to take a look at Somalia from a fresh perspective in the way ahead,” he said, describing the need to weaken the decade-old al-Shabab insurgency so that the African nation’s military forces can defeat it. Waldhauser declined to provide details of the new options that have been proposed. Currently there are about 50 U.S. commandos rotating in and out of Somalia to advise and assist the local troops. The new authorities could result in a small increase in the number of U.S. forces in Somalia, officials said. Defense Secretary Jim Mattis has approved the recommendations and sent the plan to the White House earlier this month, they added. But no final decisions have been made, and the proposal could prove politically sensitive because of the disastrous downing of two U.S. helicopters over Mogadishu in 1993 that killed 18 American troops. The White House declined to comment, deferring questions to the Defense Department. Somalia has been without a truly functioning government for two-and-a-half decades. After warlords ousted dictator Siad Barre in 1991, they quickly turned on one another, making Somalia infamous for its extreme rates of violence and the proliferation of pirates operating off its coasts. Security has improved in recent years as international efforts against al-Shabab gained ground. After the bodies of American soldiers were dragged through the streets of Mogadishu when the helicopters were shot down, the U.S. withdrew from the country. Since then, Islamist hard-liners have vied for power and al-Shabab’s attacks have spread to Uganda and Kenya. Some of the U.S. officials with knowledge of the new military proposal said it is aimed at improving the U.S. advisory mission because the African Union is planning to pull out its 20,000 peacekeeping forces in Somalia in 2020. 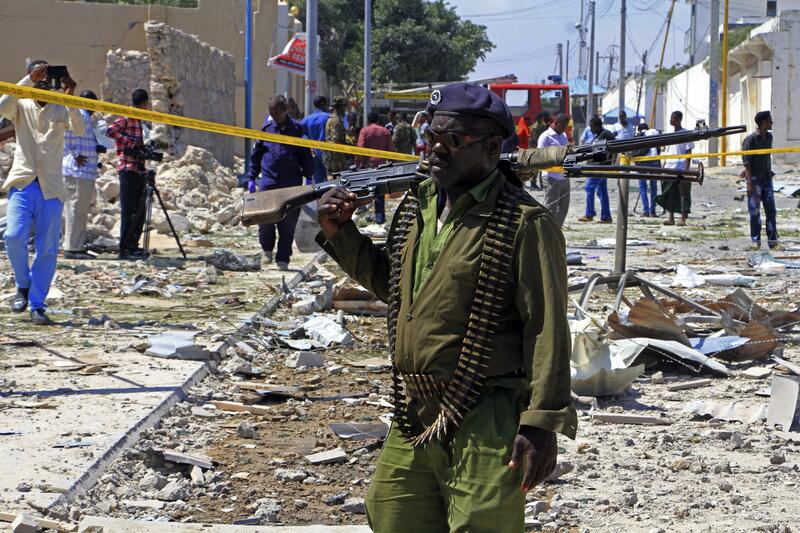 Observers say Somali troops are unprepared to fight the extremist threat on their own. Currently, U.S. forces can transport and accompany local troops. But they must keep their distance from front lines and can only engage the enemy if they come under attack or if Somali forces are in danger of being defeated. The new proposal would give U.S. forces the ability to move along with Somali troops into the fight if needed. While the American military right now can conduct airstrikes in self-defense or to protect Somali troops if they come under attack and request help, the new authorities would be broader. Officials said that under the new recommendations, the military would be able to launch airstrikes against militants on a more pre-emptive basis. For example, the U.S. could target al-Shabab fighters gathering for an attack rather than waiting until friendly forces were under fire. Al-Shabab has been ousted from most Somali cities and towns, but its suicide bombers continue to kill across large parts of the south and center of the country. That includes Mogadishu, the capital. Somalia’s new president, Mohamed Abdullahi Mohamed, inaugurated Wednesday, warned that it will take another two decades to “fix” his country. Mohamed, who also holds U.S. citizenship, won election earlier this month as Somalia tries to restore effective governance. Published: Feb. 26, 2017, 1:13 p.m. Updated: Feb. 26, 2017, 9:37 p.m.